The Monarch was adopted as the state butterfly in 2000. The monarch butterfly (Danaus plexippus), also known as the milkweed butterfly, was adopted as the state’s official butterfly in 2000. 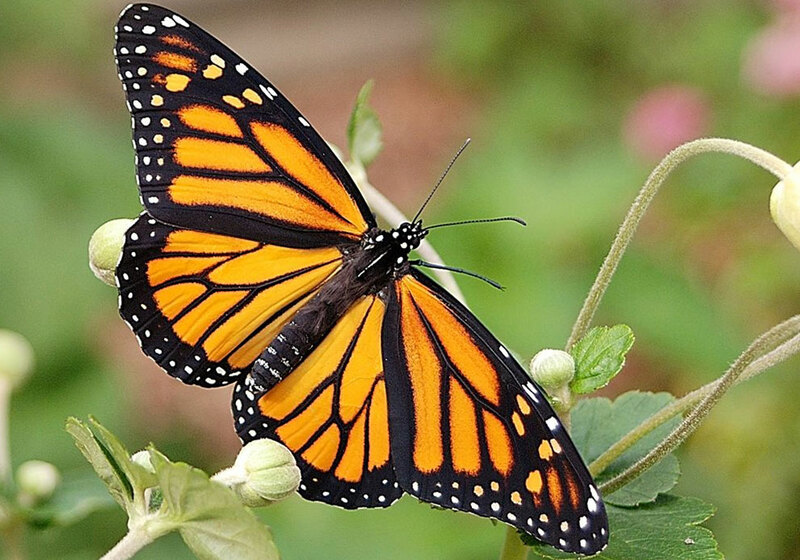 The monarch is one of the few butterfly species that migrates north and south like birds do. Approximately four generations of monarchs are born in Minnesota each summer and live roughly four weeks; the exception is the last generation of the season, which survives about six months. Each fall, members of this last generation migrate to Mexico and spend the winter in a state of semi-hibernation. Monarch caterpillars appear to feed exclusively on milkweed, which grows throughout Minnesota. This male monarch distinguishable from his female counterparts by the thin black webbing throughout his wings and two highly visible black spots on his hind wings) was photographed on Lake Superior’s north shore near Illgen City.